Van's Natural Foods Is A Popular Household Name, I Have To Be Honest Though, Before My Big Guy Started His Gluten-Free Diet, I Had Never Purchased Van's Foods. I Have Found Them In Stores Such As Whole Foods Markets, Krogers & Even My Local Target! I Took My Big Guy Shopping W/Me & He Picked Out The Breakfast Items He Wanted To Try. Van's Natural Foods Has A Huge Variety Of Healthy Options & An Entire Line Of Dairy, Egg & Gluten Free Items! My Son Picked Out French Toast Sticks & Blueberry Waffles-Yum! Van's All Started Back In The 1970's With A Waffle House By The Van Dam Family! From There They Created Healthy Breakfast Items Made W/Fresh Ingredients For Families Everywhere By Putting Them In Your Grocery Stores! 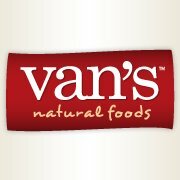 Van's Is A Company That Cares About Their Customers & Wants Everyone To Be Able To Enjoy Van's Natural Foods! Have You Tried Van's Natural Foods? Which Ones Are Your Favorite? Buy It: Purchase Your Own Van's Natural Foods At Your Local Store! Win It: One Lucky Reader Will Win 2 Coupons To Purchase Your Own Van's Natural Foods, Waffle, French Toast Sticks Or Pancakes! I would also like to try their English Muffins. My guilty pleasure would be mini chocolate chip waffles... but my healthier side would say, NO! WHOLE GRAIN. Tough choice. Maybe both?